NEW YORK- Although the iPod's popularity has waned, Apple is updating its music player for the first time in nearly three years by giving the flagship Touch model a faster processor and better cameras. 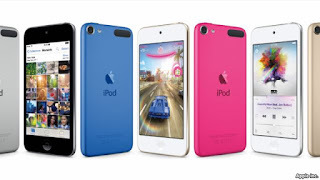 The new iPod Touch also enables Apple Music, a $10-a-month service that offers unlimited playback of millions of songs. Apple Music launched June 30 as music fans increasingly embrace subscriptions over pay-per-song services such as Apple's industry-leading iTunes. The Touch is essentially an iPhone without cellular capabilities, as it runs the same iOS operating system and most of the same apps. It extends Apple Music and iPhone apps to teens and other younger customers who might not need cellphones or cannot afford cellular service. Beyond music, the iPod Touch might get new customers hooked on Apple's apps, video and other content - such that they'll turn to an iPhone, iPad or Mac when they are ready. Prices for the Touch start at $199, the same as an iPhone 6 with a two-year service contract, but the iPod Touch requires no monthly service fees for voice, text and data. Calling is possible through FaceTime videoconferencing over Wi-Fi. The processor now matches that in the iPhone 6 and 6 Plus from last fall, rather than one from the iPhone 4s in 2011. Apple says the new chip is six times faster for general tasks and 10 times faster for graphics. The rear camera can take sharper pictures, at 8 megapixels. That matches recent iPhones and exceeds the 5 megapixels in the previous Touch. The front and rear cameras can now take 10 shots per second and slow-motion video at 120 frames per second. "Customers can experience next-level gameplay, take even more beautiful photos and enjoy their favorite music, TV shows and movies,'' said Greg Joswiak, Apple's vice president of iPhone, iPod and iOS product marketing. Apple is introducing a new, $399 model with 128 gigabytes, matching the iPhone's maximum capacity. The base model has 16 gigabytes, enough for thousands of songs, though the iPod Touch is meant to hold photos, video and apps, too. The $49 iPod Shuffle and the $149 Nano are getting the same colors, but what's inside isn't changing. Neither model can run Apple Music or the various iPhone apps.